Generally operates on railroad corridors. Commuter rail uses larger, faster, and heavier vehicles that can share tracks with freight and intercity passenger trains. 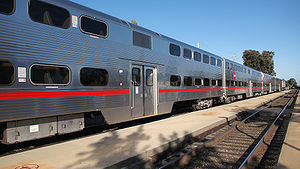 Trains are operated under railroad rules (set by Federal Railroad Administration) and generally have a conductor onboard the train besides the engineer (train operator). Service levels vary from every 5-10 minutes to every hour. Some systems may just run trains during weekday peak hours in peak directions. Service levels in general are lower than light rail and rapid transit. This page was last edited on 19 March 2016, at 23:17.